Here’s a first take comparison between the Larsen Magnacore (medium tension) set and the Rostanvo (medium tension) set. The cello is a beautiful modern instrument by Eugene Holtier. The Larsen set has been on the cello for about 10 months and the Rostanvo set has been on the cello for only an hour. I shot the videos at 8am on barely two cups of coffee and it had been three days since I’d touched a cello. The videos were shot on my iPhone propped on a music stand about ten feet from the cello. All of this is to highlight the limitations of the usefulness of this type of review. I’ll try and follow this up with more impressions after the Rostanvo set is more fully played in. – from the first time I tried them, I felt the G and C have a slightly gritty, woolly, “loose” quality…almost as if an outer winding wasn’t fully seated on the string. This isn’t something I typically hear when I’m in the audience…more something I “sense” when I’m playing the cello. – on many cellos that have this set, the D string doesn’t quite keep up with the A in terms of projection and responsiveness. This is a common problem on many A/D combinations, but I bring it up to contrast it with the Rostanvo. – incredible tuning stability. These might be my new go-to string when I have a last-minute change before a concert. I put these on the cello, tuned them up, and didn’t even need to adjust them prior to playing them for the first time. – excellent balance across all four strings. This was an aim of this company and they appear to have succeeded. – excellent balance between the A and D. This is a D-string that doesn’t seem to suffer some of the usual inferiority complexes. There is power, clarity, and responsiveness in a range that can lack these qualities. – newly strung up, the A and D tip farther into the “bright” category than I usually prefer. We’ll have to see to what degree they warm up as they are played in. – I can’t think of anything else specifically with this little time on them. Larsen still sets the standard for the beauty of the silking at the ball-end of the string. Although this is purely aesthetic, it is still one of the “pride of ownership” considerations when placing strings on your treasured instrument. For this particular instrument, the Rostanvo set seems like a step forward. 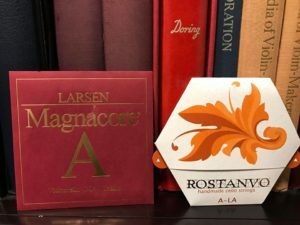 Currently, the street price of a set of Rostanvo strings is nearly $100 less than the Larsen Magnacore. For that reason alone, I’m excited about being able to offer them as an option. For certain instruments, cellists, and playing styles, the Rostanvo could very well be the ideal solution.